Large LCD for multi-parameter display on 70x52 mm backlit screen. Analytical tools: time/date-stamped surveillance of relative, Peak+/- and secondary measurements for an easy-to use multimeter with its digital keyboard equipped with lighting. Optimized ergonomics: IP67 leakproof casing, IEC61010 1,000V CAT III/600V CAT IV safety measurement terminals, power supply by normal battery or Ni-MH rechargeable battery with comprehensive management of the battery charge on screen. 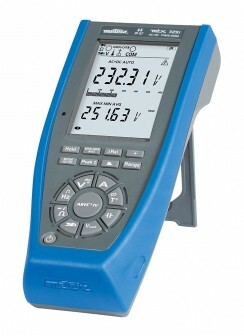 Multiple quantities measured around the main function, relative measurements and direct measurement of current via a clamp (mV output) with integration of the transformation ratio for an advanced multimeter.USB communication via the SX-DMM software delivered with the product and SCPI programming commands.